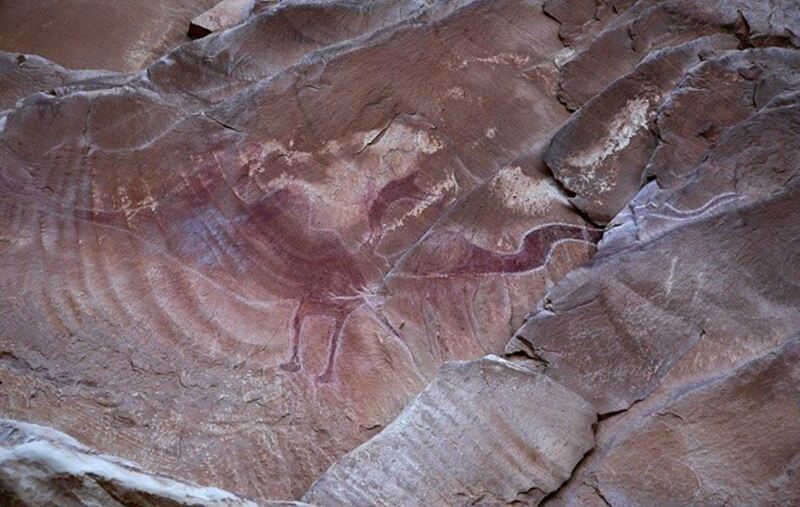 Researchers in Utah have used scientific imaging devices to verify that a centuries-old Native American rock painting in Utah depicts two people and some animals and not a pterodactyl. Some fundamentalist creationists had said the painting was of a pterodactyl and that it was proof that humans and dinosaurs lived contemporaneously. According to the debunked argument, the Earth is only several thousand years old as the Bible says instead of the 4.5 billion scientists estimate. Researchers using an X-ray fluorescence machine and technology called Dstretch that allowed them to photograph the image, upload it to a computer and then analyze it, found that the so-called pterosaur was actually five separate images—two anthropomorphic figures, a sheep, a snake-like figure and a dog. Other paintings by the Fremont people also have the anthropomorphic figures with long bodies and round heads who are accompanied by small creatures and people, says an article in Live Science . This isn't the first time scientists have studied the painting in Black Dragon Canyon to debunk creationists' claims that the paintings show dinosaurs. But this is the first time the X-ray fluorescence and Dstretch technologies were used to prove that the drawing is not of a pterodactyl. Years ago a man named John Simonson had drawn an outline around the figures to make them appear as one figure. The way Simonson altered the painting, it does indeed resemble a winged creature. But archaeologist Paul Bahn and colleagues' scientific imaging examinations showed the separate figures. Live Science reports that there are fossils of pterodactyls in the region. Some creationists even tried to identify the supposed species— Quetzalcoatlus northropi, a species that had a wingspan of 12 meters (39 feet) that lived around 70 million years ago. Some species of pterodactyl go back 228 million years. Black Dragon Canyon is in the San Rafael Swell, an area of 5,180 square km (2,000 square miles). San Rafael Swell Guide calls it an area of canyons, striking sandstone formations and awesome panoramas. In this large area various Native American tribes lived and did a great many rock paintings. The rock art in the swell is in pictographs, which are painted, and petroglyphs, which are chiseled into the rock. Much of the art has been attributed to two cultures, the Barrier Canyon Culture and the Fremont Culture. The painting now the subject of an article in Antiquity was done by the people of the Fremont Culture, who lived from about the year 1 to 1100 AD. Depictions include ordinary creatures but the subjects of some paintings and petroglyphs are still being debated. In the San Rafael Swell and nearby areas artists were busy creating thousands of works over the centuries, including in more recent years by European settlers. Not far from the San Rafael Swell is Nine Mile Canyon, which is called the world's longest art gallery, says the website. That canyon alone has thousands of petroglyphs, most, researchers think, done by the Fremont Culture and more recent ones by the Ute people. Nine Mile Canyon has the most rock art of any locale in the United States. Anybody else see a messed up Horus looking silhouette in the top picture? This makes me sad. I know it isn’t probable that they walked together, but in my heart I was hoping, I mean how fantastic would that have been? And a little bit scary! Dinosaur sculptures are upon the walls of Angkorwat Temple , Combodia, thousands of inka stones have pictures with humanoids figure with Dinosaurs and in this article just a re-creative painting debunked of an artists' imagination and in real painting there is a humanoid figure not humans' and this debunking can't state that human footprints with Dinosaurs or yeti footprints are hoax , you have to do equal labor to do that and in Mahabharata , there are mentioned big reptilian beings written 5000 years ago in Sanskrit , be in peace !!!!!! This is the second article on the front page that misuses the term. Putting forth an alternative theory - even one that has some evidence - is not debunking. This article would have been accurately titled "Imaging shows rock art to be separate figures" or even "Claim that rock art shows pterodactyl shown to be false." When I see such overt misuse of the term as in the title of this article, I conclude that the writer is simply another person overly committed to their own viewpoint and passionately working to attempt to discredit other viewpoints. Certainly even a HS student knows that overturning one piece of evidence means no more than that. In this case, it's also obvious that the co-existence of humans and dinosaurs is not something that only "fundamentalists" hold as a strong possibility. Not holding to status-quo opinions does not make one a "fundamentalist." AO is a site that lets just about anyone write an article - an approach that works well when the writers are genuinely exploring concepts. Not so well when writers abuse that privilege and attempt to use their articles to descredit all save their own viewpoint. Dinosaur sculptures are upon the walls of Angkorwat Temple , Combodia, thousands of inka stones have pictures with humanoids figure with Dinosaurs and in this article just a re-creative painting debunked of an artists' imagination and in real painting there is a humanoid figure not humans' and this debunking can't state that human footprints with Dinosaurs or yeti footprints are hoax , you have to do equal labor to do that and in Mahabharata , there are mentioned big reptilian beings written 5000 years ago in Sanskrit , be in peace !! Discovered! An Ancient Mongolian Stone Selfie! Read more about Discovered! An Ancient Mongolian Stone Selfie!